London is my favourite city to photograph couples shoots. 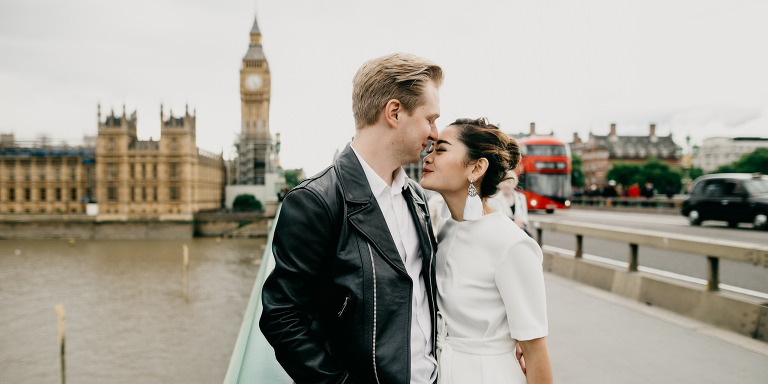 From the iconic landmarks to the contrast between old vs new architecture floating in it's hazy grey weather, it's like London was perfectly built for romantic, fun and adventurous engagement shoots! Most couples come to London on holiday and my couples shoot sessions are perfect for finally getting some cool pictures together, without having to wave your selfie stick around when you’re on vacation! I’m a London Wedding Photographer, and every week you can find me shooting couples (pre-weddings, engagement shoots, holiday photo-shoots) around iconic landmarks in town, such as Big Ben, Westminster, Tower Bridge, Buckingham Palace, Trafalgar Square, London Eye and more. Not a big fan of shooting around touristy places? I got you. London is huge and goes way beyond Big Ben. I’ve got a list of favourite secret spots to shoot which are off-the beaten path which I can share with you. Hit the contact button and let’s chat about it! Also, m ake sure to check out this blogpost where I've listed all of the best locations for engagement shoot in London here. My favourite thing is laughter, so being fun and spontaneous is at the heart of everything I do and shoot. I only take photographs that represents who you trully are as a couple, a glimpse of what it's like to be you two. My aim is to capture your jokes, your cuddles, and your dynamics. Instead of posing, I will guide you through our session by making you interact with each other and shoot you as we explore London. So you don't have to worry about a thing, just - be yourselves. If you want to hang out taking fun photos for your engagement shoot in London, this is the perfect photo-shoot for it! Best time to shoot? Early morning or late afternoon are the best time to start a London engagement shoot. This city is one of the most visited places in the world so the streets can get very crowded, specially if it’s a sunny day! Early morning and late afternoon is also the greatest time to get the best light of the day. Do we have to be engaged? Of course not! You just need to be super into each other, and want some cool photos to capture you having the best time in town! What to wear? Wear something that makes you feel awesome! I don’t like to dictate what my couples should wear as I fully embrace individualism and my aim is to capture your real personalities. If you’d like to know what colours look best in photos: primary coliurs such as white, yellow, green, red and blue makes you stand out in the hazy grey London background in photos which looks beautiful. Comfortable shoes are the way to go! Uusually during my engagement shoots in London we will be walking from one location to the next for around 2 hours, so your feet will definitely appreciate some comfy shoes! What to avoid? my number one advice is to not to bring big heavy bags for the shoot. My photography style is very spontaneous so, carry with you the bare minimum so you can be easily mobile and light on your feet. I want you to be relaxed and not worried about leaving your valuables on the floor. + big-chunky bags won’t look good in photos, trust me on this! What happens if it rains on the day of our shoot? You can never trust the British temperamental weather! I don’t even trust weather apps anymore. Most days it rains and it stops within a few minutes, it happens at almost every shoot. Just before I start shooting my engagement sessions in London, I always advise couples to embrace the weather and go with the flow; wind and some light rain do look amazing in photos! But, in case we get caught up in some heavy storm we can take cover for a few minutes and have a cup of coffee, or I’m happy to move the shoot time, or by a day, depending on my schedule! I specialise in photographing couple shoots in London and beyond with adventurous lovers, so get in touch if you want to explore this city together and make some fun, unposed, and genuine photos. Tell me a little bit about you two!